In Windows Server 2008 R2, publishing and managing applications on both pooled and personal virtual desktops is a very time-consuming and costly process. Because RemoteApp programs only partially integrate with the native Windows experience, they add to the management cost since there’s no way to organize published RemoteApp programs to users. Remote Desktop Services in Windows Server® 2012 enables you to publish and manage resources, such as RemoteApp programs, session-based desktops, and virtual desktops, from a centralized console. Using this new publishing feature, you get an historic view of resources assigned to end users, you can change published resources for any given collection, and you can edit properties of published resources. This paper contains instructions for setting up a test lab based on the Test Lab Guide: Remote Desktop Services Session Virtualization Standard Deployment and publishing and managing resources using four server computers and one client computer. The resulting centralized resource publishing test lab demonstrates how to successfully install and configure resource publishing. The following instructions are for configuring the Remote Desktop Services Publishing test lab using the minimum number of computers. Individual computers are needed to separate the services provided on the network and to clearly show the desired functionality. This configuration is neither designed to reflect best practices nor does it reflect a desired or recommended configuration for a production network. The configuration, including IP addresses and all other configuration parameters, is designed only to work on a separate test lab network. One intranet member server running Windows Server 2012 named RDSH1 that is configured as the Remote Desktop Session Host (RD Session Host) server. 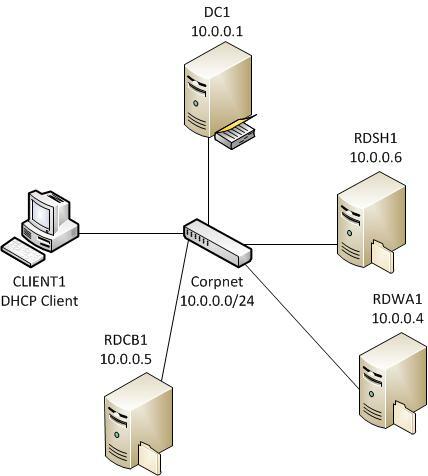 One intranet member server running Windows Server 2012 named RDCB1 that is configured as the Remote Desktop Connection Broker (RD Connection Broker) server. One roaming member client computer running Windows 8 named CLIENT1 that is used to connect to the Session Virtualization deployment. The Remote Desktop Services Publishing test lab consists of 1 subnet (10.0.0.0/24) that simulates an intranet named Corpnet. There are 6 steps to follow when setting up the Remote Desktop Services Publishing test lab based on the Test Lab Guide: Demonstrate Remote Desktop Services Session Virtualization Standard Deployment. Step 2: Publish a RemoteApp Program – RemoteApp programs are published to either a session collection using Server Manager. Step 3: Enable File Type Association on a RemoteApp Program – Enable file type association to assign the file association on the client device to the associated RemoteApp program. Step 4: Configure DNS Feed Lookup for RemoteApp and Desktop Connections – Configure the Remote Desktop Services DNS feed lookup to automatically discover the RemoteApp and Desktop connection URL when users type in their email addresses. Step 5: Test Published RemoteApp Program using RD Web Access -- CLIENT1 is a Windows 8 computer that is used to test that you can successfully connect to the published RemoteApp program. Step 6: Snapshot the configuration -- At the completion of the lab, snapshot the configuration so that you can later return to a working Session Virtualization deployment Test Lab. This Test Lab Guide uses the Demonstrate Remote Desktop Services Session Virtualization Standard Deployment test lab as a starting place. Please complete the steps in Test Lab Guide: Demonstrate Remote Desktop Services Session Virtualization Standard Deployment before proceeding with the remainder of the steps in this guide. If you have already completed the steps in the Demonstrate Remote Desktop Services Session Virtualization Standard Deployment Test Lab Guide and saved a disk image or a virtual machine snapshot of the Demonstrate Remote Desktop Services Session Virtualization Standard Deployment, then you can restore the Configuration and proceed to the next step. Log on to the RDSH1 server as the CORP\Administrator user account. In the REMOTEAPP PROGRAMS tile, click Tasks, and then click Publish RemoteApp Programs. On the Select RemoteApp Programs page, select Calculator and Wordpad, and then click Next. When the RemoteApp program is published, click Close. Log on to the domain controller as the CORP\Administrator user account. On the domain controller, open Group Policy Management. Click Start, type Group Policy Management, and then click Group Policy Management.. Expand Forest: corp.contoso.com, and expand Domains, and then expand corp.contoso.com. Navigate to User Configuration -> Policies ->Administrative Templates -> Windows Components -> Remote Desktop Services -> RemoteApp and Desktop Connections. Double-click Specify Default Connection URL, and then click Enabled. In the Default Connection URL box, type https://RDWA1.corp.contoso.com/RDWeb. Under the REMOTEAPP PROGAMS heading, right-click WordPad, and then click Edit Properties. Configure DNS Feed Lookup for RemoteApp and Desktop Connections. On the domain controller, open DNS Manager. Click Start, type DNS, and then click DNS. Right-click the forward lookup zone where you want to create the TXT record, and then click Other New Records. Click Text (TXT), and then click Create Record. In the Record name (use parent domain if left blank) box, type _msradc. In the Text box, type https://RDWA1.corp.contoso.com/RDWeb/Feed. You can ensure the RemoteApp program published successfully by connecting to the WordPad application that was published. Log on to the CLIENT1 computer as the CORP\Administrator user account. In the Internet Explorer address bar, type https://RDWA1.corp.contoso.com/RDWeb and then press Enter. In the Domain/user name box, type CORP\Administrator. In the Password box, type the password for the CORP\Administrator user account, and then click Sign in. Click WordPad, and then click Connect. Verify that the WordPad application appears correctly. If your lab is based on virtual machines, save a snapshot of each virtual machine and name the snapshots Publish RemoteApp program. If your lab uses physical computers, create disk images to save the Remote Desktop Services Publishing test lab configuration.